Cleaning out my late father in laws house we decided to keep this piece of furniture as it was well built and in good working order. But, for those of us that do not enjoy mid century modern design it was not very attractive. 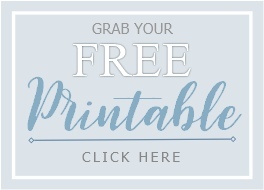 But in it's simplicity we saw the potential for a piece of furniture in a style that in it's day was quite simple and utilitarian, it's just that to our 21st century eyes it looks vintage and charming. 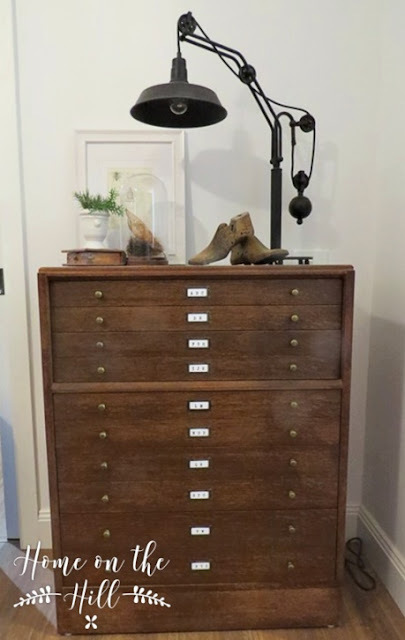 Inspired by some of the lovely makeovers out there, we set about converting this set of every day drawers to resemble drawers from the early 1900's used to store maps. First step was to remove the knobs and handles. 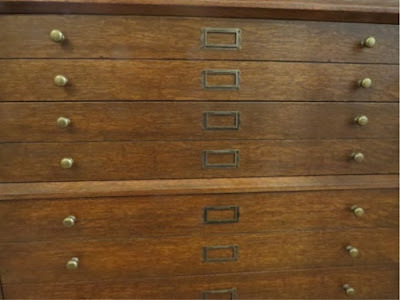 Sand back to remove any varnish or wax, dirt etc and also on the top two drawers to remove the paint. Then my husband used a hand saw to create a depression in each drawer front to simulate the gap between two drawers. he used a straight edge clamped to the drawer front to run the saw up against to keep the line straight. 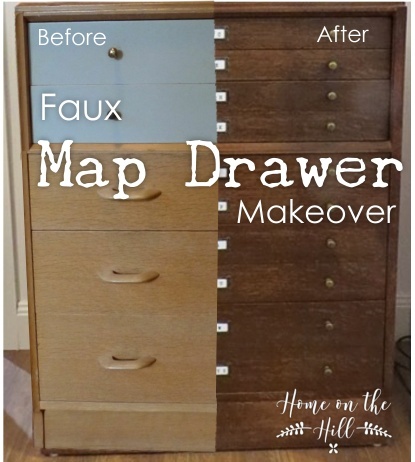 This method worked quite well, and was a lot less work and I think more authentic looking than adding faux draw fronts to each drawer, plus it didn't change the way the drawers fitted into the frame. 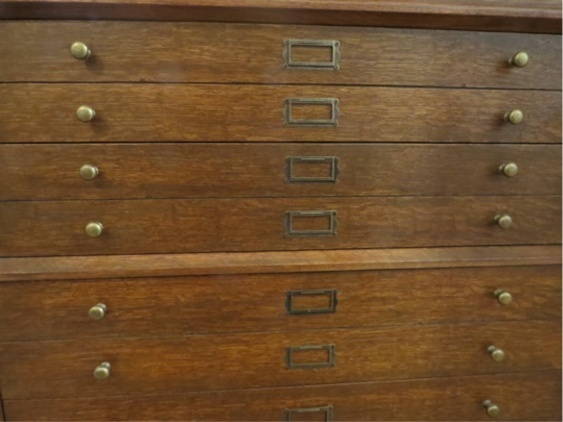 These set of drawers also had a curved decorative strip of wood down each side of the frame at the front which we removed and base plate was set back, so it was removed then brought forward and reattached. Next step, we stained the piece all over with a mid brown stain that allowed the grain in the timber to still show through. I used Feast Watson brand prooftint. I then waxed the whole piece and buffed it to achieve a nice shine. Last step was to drill new holes for the small aged brass knobs I purchased online, making sure to get them all in alignment. 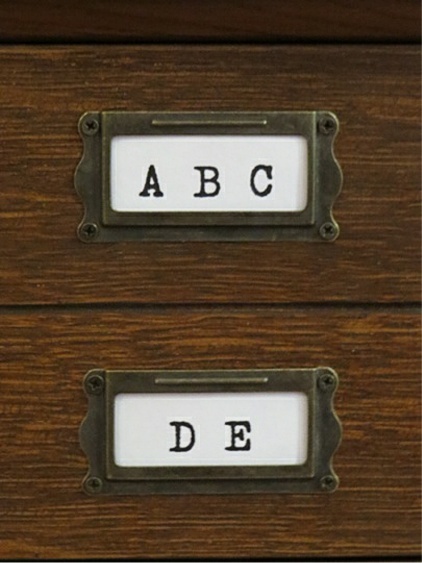 We also added some aged brass drawer label holders and inserted labels I printed out.